The world is facing a backlash against globalization from some of the most advanced economies, while the global trading system undergoes the biggest threat it has ever experienced to its existence. There have been important efforts to foster some deals and agreements, such as the US-China Comprehensive Economic Dialogue, or the launch of Free Trade Negotiations between Australia and Peru. Other efforts have promoted deeper regional integration, like the IDB’s study on the viability of a Latin America and Caribbean Free Trade Area. However, other long-lasting agreements and negotiations have been jeopardized – TPP and NAFTA to name two. In a context of uncertainty regarding the path of the global trading system, Trade Facilitation Reforms provide an opportunity to speed up global trade. Trade Facilitation can be defined as policies to reduce transaction costs and create standard efficiencies. Recognizing that an effective implementation of those reforms requires the involvement both of governments around the world and the private sector, the World Economic Forum, along with other relevant stakeholders, created the Global Alliance for Trade Facilitation. The Alliance seeks to support trade facilitation efforts measured by actionable data, and has the Global Enabling Trade Report as its flagship publication, which helps to promote evidence-based dialogue and policy-making. The Global Enabling Trade Report, published since 2008, measures trade facilitation using the Enabling Trade Index (ETI). 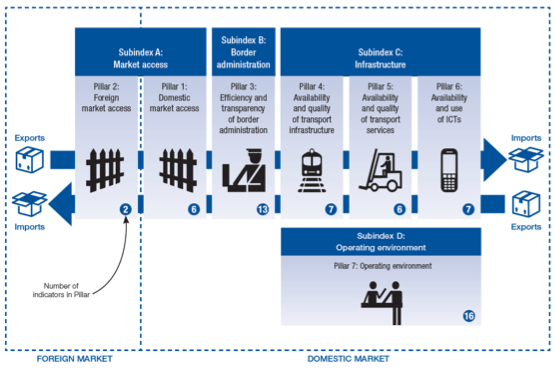 The ETI assesses whether economies have set up market-access policies, border institutions, infrastructure, and broader business and regulatory policies, which facilitate the free flow of goods over borders until reaching their destination. The image below depicts the ETI’s conceptual framework: 57 trade-enabling metrics are aggregated to produce a composite indicator, spread over four subindexes and seven pillars, containing information from different international organizations’ databases, as well as indicators derived from the World Economic Forum’s Executive Opinion Survey conducted in 141 economies. Using the latest ETI data, a recent study shows that improvements in the ETI are associated with an increase in bilateral trade flows. 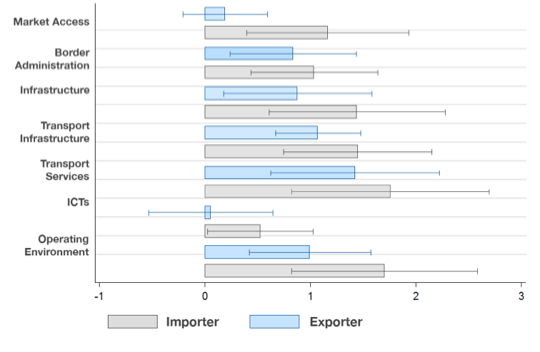 By means of a gravity model of international trade, the analysis also explored to what extent the ETI subindexes capture the drivers of international trade. The estimations show that infrastructure – measured by the ETI as the availability and quality of transport infrastructure and services – is the main driver of international trade. The chart below shows that improvements in infrastructure are associated with larger increases in bilateral trade flows. Infrastructure as a major trade driver seems to reflect the Chinese “Belt and Road” approach to trade policy and the increasing importance of transport connectivity. China has understood the key role of infrastructure in boosting its competitiveness. This fact is reflected in the ambitious “Belt and Road” strategy that builds on the historic Silk Road to redraw the routes of international trade. Investment in a wide variety of projects (including railways, ports, roads, gas pipelines, to name a few), has already surpassed $1 trillion dollars, and it is expected to improve land and maritime transportation covering around 60 countries, which represent 30% of global GDP and 35% of the world’s trade. By pursuing the “Belt and Road” initiative, China attempts to follow the path through which the US reduced its trade costs in the 19th century. In a study on the scope and challenges of the initiative, Lawrence & Toohey argue that technological advancements and investments in railroads considerably reduced transportation costs which, along with the reduction of corn tariffs in the UK, opened up the American economy and lowered its prices. The authors suggest that for the Chinese initiative to be successful and benefit all its participants, it must be accompanied by access to export markets in China and the rest of the world. The side effects of the initiative are as important as the main purpose of reducing trade barriers and improving competitiveness. China’s soft power might be increased in emerging markets with similar development aspirations. International research collaboration will continue to experience an upward trend, bringing together countries such as Russia, Poland, Saudi Arabia and Singapore. Finally, if appropriately implemented, the “Belt and Road” initiative has the potential of rebutting protectionism while fostering inclusive growth.